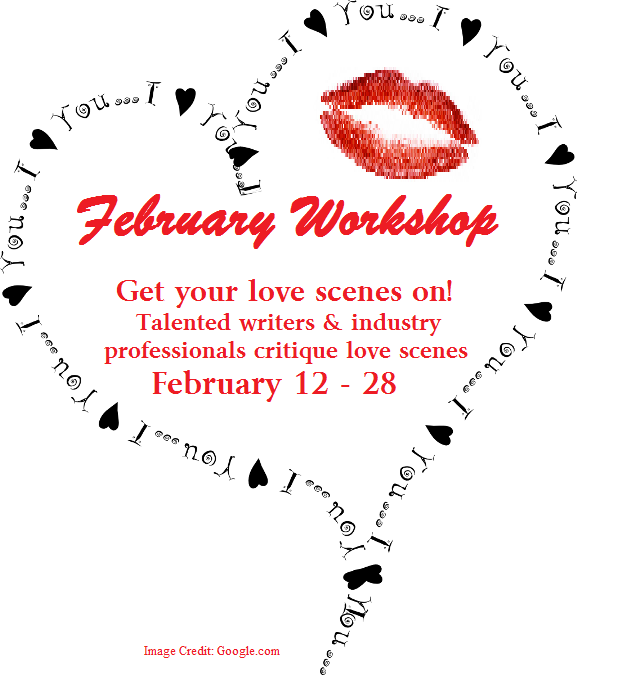 Over the next few weeks, some really special friends of mine are stopping by to critique participants’ love scenes. 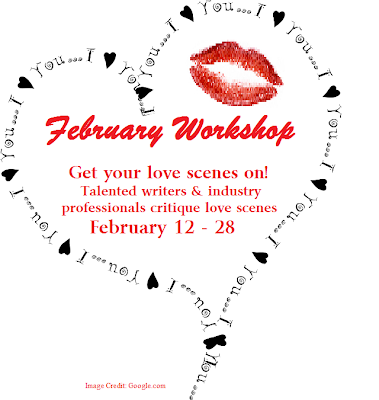 Please join us and find out what’s working and what’s not with our lucky winners’ scenes. Kimberly writes young adult science fiction and is represented by Brittany Howard of the Corvisiero Literary Agency. She holds a Bachelor’s degree in Aeronautical Science, which basically means she’s kind of a geek and loves flying airplanes. Naturally, her books tend to include aviation, hot flight instructors, aviator glasses, and let’s not forget kissing! When Kimberly’s not flying, writing, or reading, she’s hanging out with her husband, three-year-old son, and two dogs. You can follow Kimberly on Twitter at @kpchase817, follow her blog here, and on facebook here. It’s slow at first. But when my teeth gently tug his lower lip, noises I didn’t know a person could make bubble out of his throat and we’re kissing soft, hard, and everything in between. The kiss happened a little too fast for me. I want details as to how they actually start kissing. For example I’d do something like this: “But before I can finish, Henry scoots closer to me, wiping a tear off my cheek. His hand is soft–hesitant. I’m speechless as he slowly leans down, brushing his lips across mine. It’s slow at first…” Henry’s hands slide up my thighs, grab my hips, pull me in. His fingers tangle in my hair as my mouth trails down his neck, resting in the perfect hollow between his collarbones. His growls vibrate against my lips. I shift onto my back. Henry braces himself on one arm above me, brown eyes dazed and glassy. The callused fingertips of his free hand flutter delicately over me like he’s afraid I’ll break, making me shudder. Brushing bare skin above my shorts. Slipping under my t-shirt. Tracing my ribs. Edging beneath my bra. HOT HOT HOT! Noise spills into the house, cutting him off. Henry jumps up. He glances at his crotch and groans. Embarrassed is definitely a new look for him. I swallow a giggle. I want to brag I totally did that but what just happened has to stay amazing. I turn away so he can adjust himself in private. When I look back, he’s gone. This opening was a little hard to follow b/c it took me a few seconds to figure out who was the girl and who was the boy. I know I’m jumping into this in the middle, so I hope I’m getting this right. Kiral-Girl and Ari-Boy?? Ari He dragged her to him and kissed her. She had never been so happy to be proven so very, very wrong. Ari angled his mouth over hers, running his hands up her arms and then tangling his fingers in her hair. Each brush of his lips, his tongue, sent delightful shivers through her. Kiral linked her arms around his neck, clinging for dear life. YES! If he stopped, she would murder him. Thanks for sharing this with me! I think you can slim down some of the internal thinking bits, but overall a nice kiss. Come back tomorrow for more love scene critiques! Comments welcome! As always, be respectful and kind with your comments. Thanks for the critique! I’ve really enjoyed reading these.